Contrary to what may be popular belief, I didn't start reading to Eisley when she was a baby. I always saw myself as the mom who would pull her baby onto her lap, choosing a handful of board books to read, pointing out shapes and colors and letters. I would do it here and there throughout the first year-or-so of her life, but it didn't happen on a regular basis until I stopped breastfeeding Eisley when she was just shy of 18 months. Up until that point, nap time and bedtimes consisted of snuggles and breastfeeding, then right to bed. Once our routine changed, it was the perfect time to add in stories before tucking her in at night. It happened rather naturally, and just like that, it became a treasured part of each day. Since that time, we always, always read before nap time and bedtime. (I can honestly think of only a few days when we haven't read a book before going to bed, and I'm pretty sure it was due to either traveling or her being sick.) I love that this tradition has become so cherished by Eisley, especially because some of my fondest childhood memories involve being snuggled beside my mom as she read books to my sisters and I. Library hauls, holiday books, tattered favorites. I learned to fall in love with beautiful illustrations and captivating stories at what felt like a very young age. This is all to say that books mean the world to Eisley. And it has been quite delightful for me to realize that she is the perfect age to start introducing chapter books to our read-aloud repertoire. For a while, I thought it would be ridiculous to read a chapter book—one without any pictures at all on the majority of the pages—to a preschooler, and simply didn't try. But more and more I've been pleasantly surprised when I introduce different challenges or concepts that are beyond my daughter's age range (or, at least, what our modern culture tends to expect preschoolers are capable of). So, one day I asked myself: Why not try? I browsed a few book lists I found online, and ultimately ended up checking out Stuart Little on a whim one afternoon at the library. And Eisley absolutely loved it. (I had never read it before then, and found the story completely bizarre and kind of confusing. But she giggled and begged for more chapters every day!) After a while I realized I still preferred our regular picture books for reading before bedtime, opting to add more read-aloud time to our days: while she ate a snack, after we had lunch, during bath time, or while she was coloring or doing some other creative activity. And more often than not, I found she was able to sit still and listen to the story much longer than I would have thought. She fell in love with so many of the characters and would talk about things that happened within the pages of a chapter book long after we finished reading. Catwings — If you're looking for a chapter book to read aloud and you've only ever read picture books, I think this is the perfect choice. This book has an abundance of beautiful, full-color illustrations, is a very sweet story, is quite enjoyable to read out loud, and the book itself is not very long at all. I remember reading these as a girl and wishing so much that the books were three times as long! Catwings Return — This book is the perfect continuation of the first story, and we loved it just as much. Again, this one is a quick read and a fairly easy transition from picture book to chapter book. 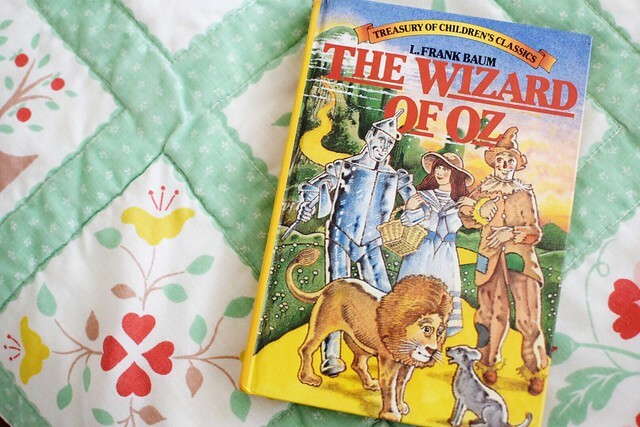 The Wizard of Oz — Would you believe I never read this book until now? I was trying to find a chapter book that I already owned that would be suitable to read to Eisley, and I saw this on my shelf—a book my mom gave me years ago when I was in the play as a teenager. Eisley and I both adored the story, and I loved how there was so much more within the pages of this book than in the movie. I never realized how much the original differs from the story most of us are familiar with, due to the popularity of the film! I definitely recommend this one. And I'd love to read more of the books in this series. Ramona the Pest — After picking up this book, I realized we were reading the series out of order, but started anyway just to see if Eisley would enjoy them. She immediately became obsessed with Ramona Geraldine Quimby and hasn't turned back since! In this book, I was a little bothered by Ramona's attitude. (I know it's to be expected from a young child to a point, but Ramona is 5 in this book and some of it was a little excessive. I definitely had to interject some thoughts here and there as we read, but sometimes those are perfect opportunities to reinforce your own expectations!) It was a really fun book to read aloud, and I definitely recommend this series as a fun way to introduce your children to chapter books. As a side note, I wasn't sure how I'd feel about the modern illustrations (they aren't the ones I remember from my own childhood!) but as it turns out, they are just perfect. I love the colorful covers with the newer artwork, and Eisley can recognize them from a mile away! Beezus and Ramona — We immediately began this book after finishing Ramona the Pest, because it was such a hit with Eisley! This book is told from the viewpoint of Beezus, and Ramona is four years old and full of shenanigans. It so beautifully shares the highs and lows of sisterhood and the emotional struggles of adolescence, but somehow manages to do it in a way that can keep the attention of even very young children. Of the books we've read in this series, I think this would have to be my favorite so far. Ramona and her Father — In this book, Ramona's father loses his job and ends up staying home with his daughters as the mother takes a full-time job to support the family. Because we recently dealt with Jay being laid off from his job, this book seemed timely! This wasn't my favorite of the Ramona books, but it was still worth the read. The chapters seemed much longer than the other two we read, but Eisley still enjoyed it and we're eager to continue with this series during the summer. As for the books we started but never finished, they include Winnie the Pooh (I've heard this is a wonderful read-aloud, but although we made it through about half of this classic tale, I found the language a bit complicated to read to a preschooler, and she didn't understand much of the wittiness that is meant for someone a wee bit older), Ramona the Brave (they didn't have the version with the newer artwork at the library and, oddly, it made Eisley much less interested because she didn't recognize the illustrations on the cover or inside), Charlotte's Web (we started it and I made the mistake of letting her watch the movie before we finished the book, so she lost interest in us reading the story—lesson learned! ), and the Junie B. Jones series (we tried one book but I couldn't handle the main character's dreadful attitude and overall brattiness). After we finish the Ramona series, I have a few books in mind to pick up next. The Little House series is probably my favorite of all time (I try to read the entire series once every year or two), so as much as I want to read them to her now, I may wait a bit to be sure she appreciates them as much as her mama. I'm thinking we may try another Beverly Cleary favorite (The Mouse and the Motorcycle, perhaps? ), Pippi Longstocking, or another in the Catwings series (I just now realized there are more!). I'd love to hear of any chapter books you've enjoyed reading to your own younger children—or any you remember loving as a child. I'm compiling a list of books to read with Eisley this summer and during her kindergarten year, and would love to hear any recommendations you may have! This is pretty inspiring to me. We read books at bedtime, but I don't really enjoy it because I am soooo tired at that point. I hate to admit that I don't like reading to my kid when I love to read so much! But I think it's the timing. Most days I'm working so I can't read to her then. But it would be fun to do more of it on the weekends, if she's up for it. Thanks for sharing! It's so great that she's getting into chapter books! Reading is one my favorite hobbies and I wish I could get back into it (Netflix has really killed any motivation I have to read). I forgot where I read about this but there was a man who read the Lord of the Rings to his daughter when she was about 5 or 6. I personally found the book extremely long-winded and boring but he said his daughter was captivated by the story and it really helped her with her imagination. After they read the book, they watched the movie together and he was surprised at how well she remembered the story and characters. Some of my favorite children's chapter books that may still be a little advanced for her age are The Boxcar Children series and The Magic Tree House series. My daughter is 5, and we've also read a few of the Ramona books and are now reading Charlotte's Web. The Mercy Watson books by Kate DiCamillo are great - very silly and some full color illustrations. We've also read the first 10 Magic Treehouse books and a handful of the older American Girl books (the newer ones are not at all educational), both of which led to a lot of discussions of history and geography. Next we're going to try Charlie and the Chocolate Factory then maybe Matilda. I am overwhelmed with how many books I want to read to her! I'll have to add The Wizard of Oz the the list, I've never read it. I guess she might still be a little young for these (but like you said, you never know, right? ), but I LOVED the books A Little Princess and The Secret Garden growing up. Definitely two of my top favorite of all time. I hope I can pass on a live if reading to my girls too! I remember loving the Ramona books as a girl. She may still be a little young for them but, my mom read the Indian in the Cupboard series to my brother and I growing up, they are so fun! Also I love Phyllis Reynolds Naylor's Alice series(but they are definitely geared toward middle schoolers).